Kathrin was born in Zurich in 1960. 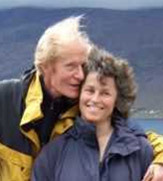 She studied linguistics in Zurich, followed by a doctorate in cognitive science in Edinburgh. For seven years she worked as a researcher and lecturer. Before leaving academia she spent three years exploring the linguistic landscape of Nepal and wrote a description of Dhimal, an endangered Tibeto-Burman language of Eastern Nepal. Kathrin came to Buddhism early in life due to the influence of her paternal grandfather, Max Ladner, one of the Buddhist pioneers in Switzerland. In recent years she has published fragments of her grandfather’s writings. 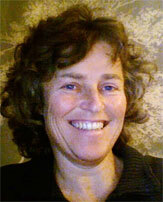 In 1982 Kathrin took up Zen meditation in the Zurich dojo of Deshimaru’s International Zen Association and she continues to do Zazen to this day. For a time she was an active member of the Glasgow Zen Group and later she ran a small Zen meditation group in Frankfurt. Kathrin also practises and teaches Tai Ji (the long Yang form as taught by Master Chu in London and Frieder Anders in Frankfurt). Kathrin does the cooking at Shanti Griha. Cyriaque was born in Cherbourg in 1962. He has worked as a caricaturist all over Europe. For a while he lived in the Free State of Christiana, a huge alternative community in Copenhagen that is visited by half a million tourists each year, so it comes as no surprise that he was looking for something a little more tranquil when he came to Scoraig. Cyriaque is not the person you think he is. Since the day when an astrologer told him that his life would begin at 50 he has been in a deep meditation, waiting for his life to start. Shanti is a cross breed. 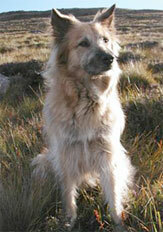 She was found in a dog home in Glasgow in 2002 and named after Shanti Griha.